Most of the buzz for junior equipment centers on offering adult technology at the junior and kid's level. Factor in "family time" and this year's focus encompasses more family fun on the slopes, as well as in the winter elements. Winter is a wonderful time of the year for young children and their parents to play outdoors - together. Resorts and snow sports equipment manufacturers are making the experience easier and more enjoyable than ever with high tech features and trendy colors. When it comes to what to wear and use on snow, kids get to pick and choose among skiing, snowboarding, snowshoeing, and cross-country products. Outerwear and equipment suppliers are giving kids what they want-clothes and gear with sophisticated features built into adult models. For instance, soft-shell jackets that have been popular for adults are more widely available for juniors this winter. Soft-shell outerwear is stretchy and warm, without the bulk. As Doug Faude, president and owner of Molehill Mountain Equipment, puts it, "The Michelin man look is out." Trendy styling and extras like mesh goggle pockets and cell phone pockets are fun, useful features finding their way onto junior apparel. Colors are fun and bright, with reds and blues especially in demand. Like attire, junior skis and snowboards now look and perform similar to their "adult" counterparts. Also, with more and more female-specific gear for adult women, there's a trend toward snowboards that are engineered specifically for junior girls and little girls. Boot manufacturers are making boots that are easier to get in and out of right down to the tiniest sizes. 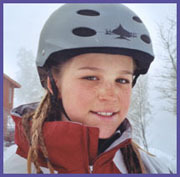 Because kids grow quickly, adjustable "grow" features are becoming more popular in helmets, outerwear, bindings, and even boots. Warranties and seasonal equipment leases (i.e. performance equipment packages at a specialty shop) also are popular programs right now, with manufacturers working with retailers on programs that will save parents from having to purchase new gear every year. Sophisticated features and cool graphics are showing up everywhere this winter. Manufacturers are responding to kids who like to listen to their own soundtracks on the hill with jacket pockets that hold CD players and helmets with speakers built into the earpads. And with in-mold technology becoming more widely available, helmets are more lightweight and have cooler graphics than ever before. BUY ONLINE! Junior and kid's gear on sale! . POC Helmets & Goggles: Spine protection too - what's HOT? Avalanche Beacons & Shovels: Be prepared! FABRIC CARE: You’ve got new waterproof outerwear.. keep it that way!